TODAY's Matt Lauer gives an overview of the brand-new LEED-certified George W. Bush Presidential Library, which has 80 terabytes of digital information including 4 million photographs, 200 million emails and 43,000 artifacts. When the George W. Bush Presidential Library and Museum is dedicated on Thursday, President Barack Obama, all the living former presidents, dignitaries and thousands of visitors will descend on the campus of Southern Methodist University in Dallas to see the largest and most expensive of all the presidential centers. Opening to the public on May 1, the library will showcase some of the most trying moments of the 43rd president's time in office, including the bullhorn he used when he spoke to first responders working at Ground Zero after the 9/11 terror attacks, and one of the maps showing Hurricane Katrina's damage with "The President has seen" stamped in red lettering across the top. Docent Patricia Flynn demonstrates an interactive with information about conflicts in Afghanistan and Iraq during a tour of the George W. Bush Presidential Center on Wednesday. More than 8,000 people are expected to attend Thursday's invitation-only dedication of the center. Though it will crowd out the others in the headlines this week, the George W. Bush Presidential Library is but the 13th of the presidential library and museum facilities. Here's how it stacks up. Last year, only 44,549 people visited the Herbert Hoover Presidential Library and Museum. Among the exhibits at the facility in West Branch, Iowa, are 440 embroidered flour sacks — gifts from the people of Belgium as thanks for establishing the volunteer-driven relief program during World War I that distributed food to the war-ravaged country. 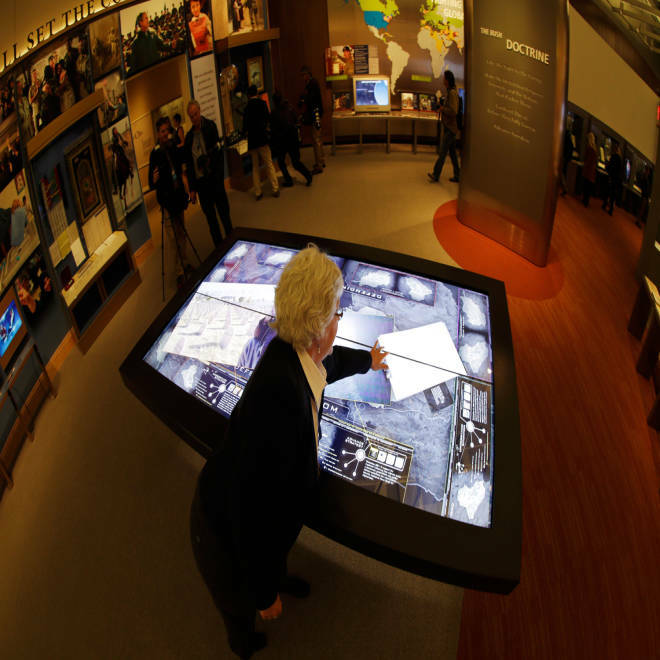 With well over 300,000 visitors in FY2012, the William J. Clinton Presidential Center in Little Rock, Ark., is the most popular of the presidential libraries. Clinton's library includes a full-scale replica of the Oval Office, set up just as it was in the Clinton White House. It's "always a draw for young and old," says Clinton Foundation spokesperson Jordan Johnson. 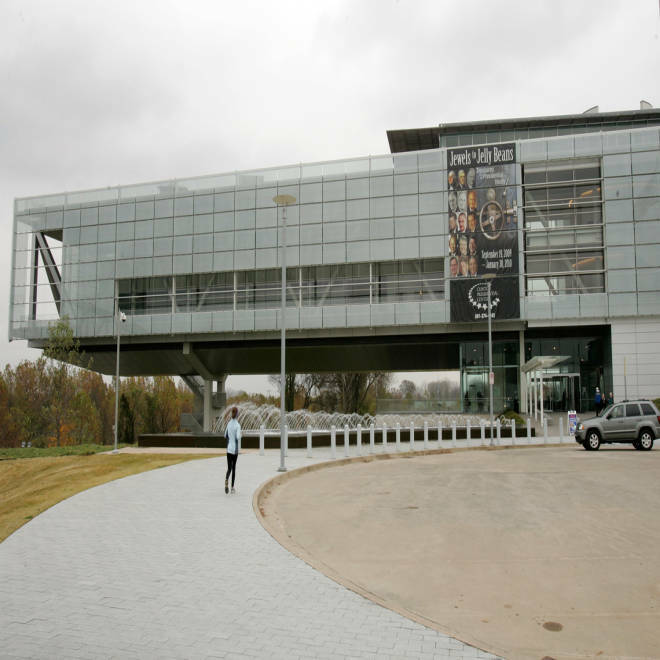 The Clinton Presidential Library in Little Rock, Ark., seen in November 2009. Every president since Herbert Hoover, who served as commander in chief from 1929 to 1933, has been awarded a presidential library. At 47,000 square feet, Hoover's measures smallest of all. Compared to the Clinton Presidential Center, "our footprint is smaller than their glass front," says Hoover archivist Matt Schaefer. George W. Bush's entire facility, which includes a library, museum, policy center, and institute, takes the cake at 226,560 square feet in total space across all building floors . As the saying goes: Everything is bigger in Texas. NBC's David Gregory reflects on the presidency of George W. Bush, who is preparing to open his presidential library on Thursday. 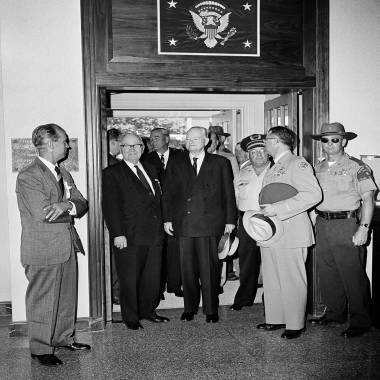 Former Presidents Herbert Hoover, right, and Harry Truman walk through doorway of the Herbert Hoover Presidential Library in West Branch, Iowa, on Aug. 10, 1962. The two took a short tour of the library during a dedication ceremony in Hoover's birthplace on his 88th birthday. The Hoover Library — the facility is filled with 6,600 cubic feet of traditional archive material, 140 cubic feet of audio and video, and some 9,000 museum artifacts. By contrast, the Nixon Presidential Library and Museum boasts 28,000 cubic feet of materials on display, including the telephone Nixon used to call Neil Armstrong and Buzz Aldrin on the moon to congratulate them on the first successful lunar landing. Despite its relatively small stature, the dedication of Hoover's library in 1962 began the important tradition of having living presidents attend. Crossing party lines, former President Harry Truman joined Hoover, saying, "I wouldn't miss it." Eisenhower was invited but didn't attend. Once again, the honor goes to the George W. Bush presidential library. The project was designed by Robert A. M. Stern, the dean of architecture at Yale. The price tag? $250 million, according to architecture firm spokesman Christian Rizzo. At the opposite end of the spectrum sits the Franklin Delano Roosevelt Presidential Library. Adjusted for inflation, FDR's facility cost about $6 million. 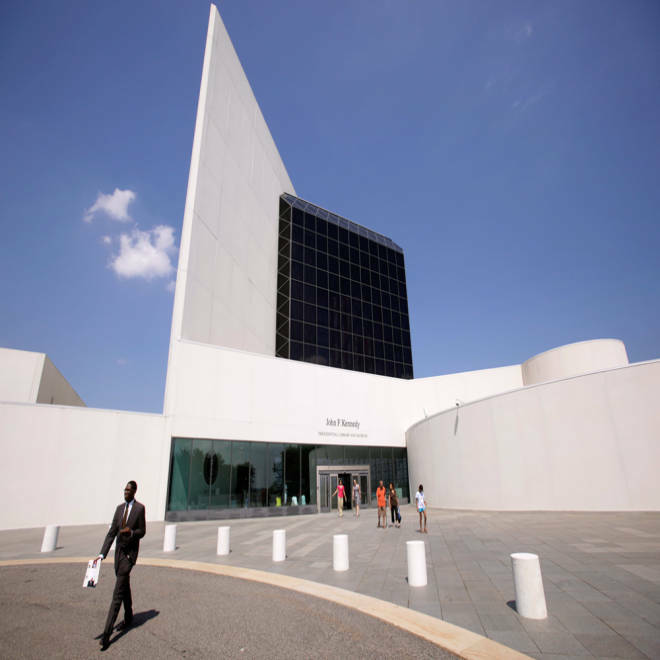 Jacqueline Kennedy Onassis, ever the trend-setter, chose I. M. Pei to design the John F. Kennedy Presidential Library and Museum before Pei was a household name. Boston's John F. Kennedy Presidential Library and Museum. The least-famous architect was one of the presidents himself. Among Roosevelt's many passions was architecture and the final version of his library hewed closely to a Dutch Colonial sketch he drew envisioning the project, which no doubt saved a hefty chunk of change in design fees. George W. Bush entered the White House after one of the closest and most contested elections in U.S. history. The two-term president served during some of the nation's most turbulent times. 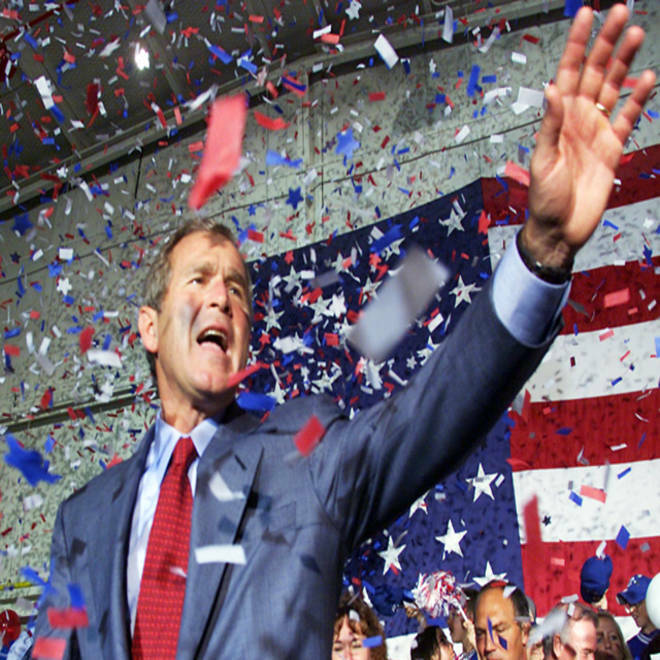 Take a look at the pivotal images from George W. Bush's presidency. Who foots the bill for presidential libraries?